LanguageLine’s web-based Advanced Medical Training for Oregon Interpreters is designed to fully develop medical interpreting skills while removing the constraints of time and place to enable participants to access the training from any location while eliminating costs associated with travel time and missed work hours. 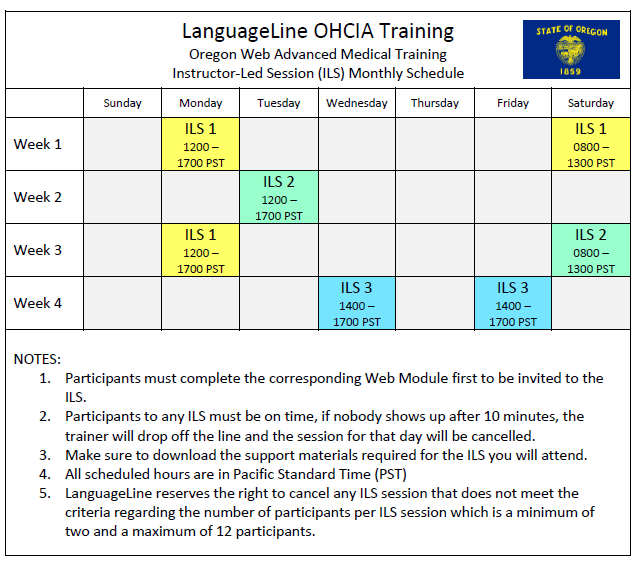 Developed by a team of healthcare practitioners, subject matter experts, and professional trainers in the medical interpreting field, this program is approved by the Oregon Health Authority, Office of Equity and Inclusion, and the Oregon Health Care Interpreter Program and endorsed by OHCIA. Click here to register now. The Advanced Medical Training for qualified OHCIA members is $300. Be sure and check yes as an Oregon Interpreter or OHCIA member. Schedule of sessions is below. Following registration you will receive a confirmation email. A LanguageLine scheduler will send a follow-up email with guidance for enrolling in the course. Learn more about interpreting qualification and certification program.